Max was my Watch With Zack client for the day, and his goal was simple: to snag as many balls as possible. My goal, meanwhile, was a bit more complicated. 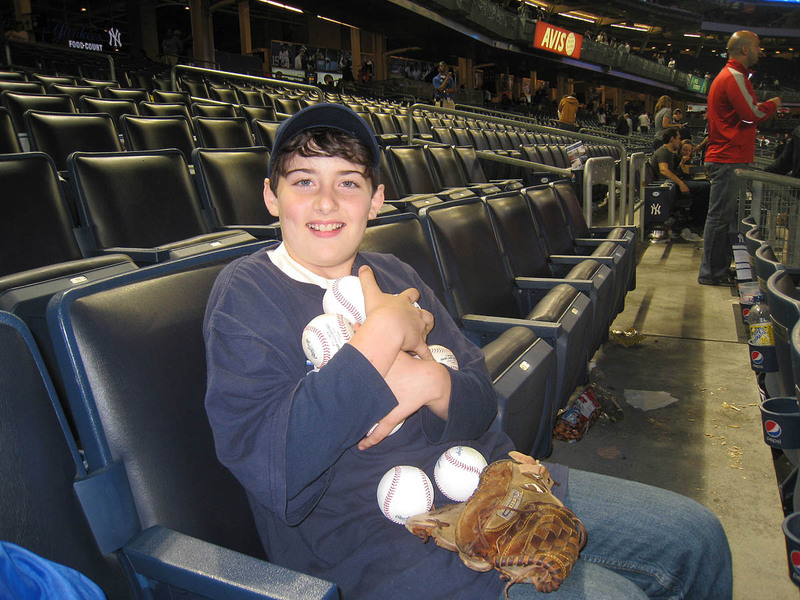 Not only did I want to make sure that he went home with an absurd number of balls, but I wanted to snag exactly two for myself — just enough to keep my streaks alive (815 consecutive games with at least one ball and 340 consecutive games with at least two), but not too many to ruin my plan to snag No. 6,000 two days later at Fenway Park. My lifetime total at the start of the day was 5,995, so yeah, I knew I could snag as many as four, but I wanted to leave a little breathing room. I put my glove away after that, and let me tell you, it felt strange. 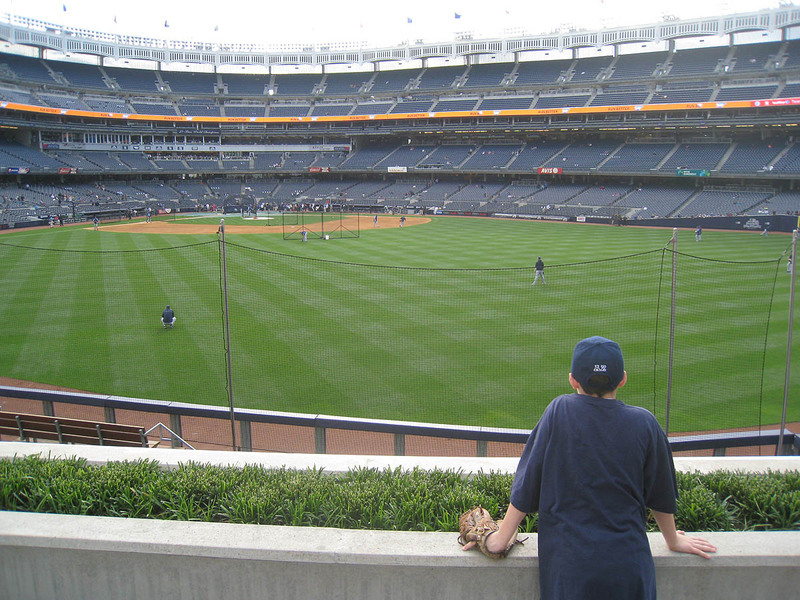 I don’t know what I would’ve done if a home run had come right to me. I suppose I might’ve tried to catch it bare-handed (just for the challenge) or stepped aside in the hopes that Max would snag it on the rebound. As it turned out, we didn’t have good luck with homers, so we focused on getting toss-ups. 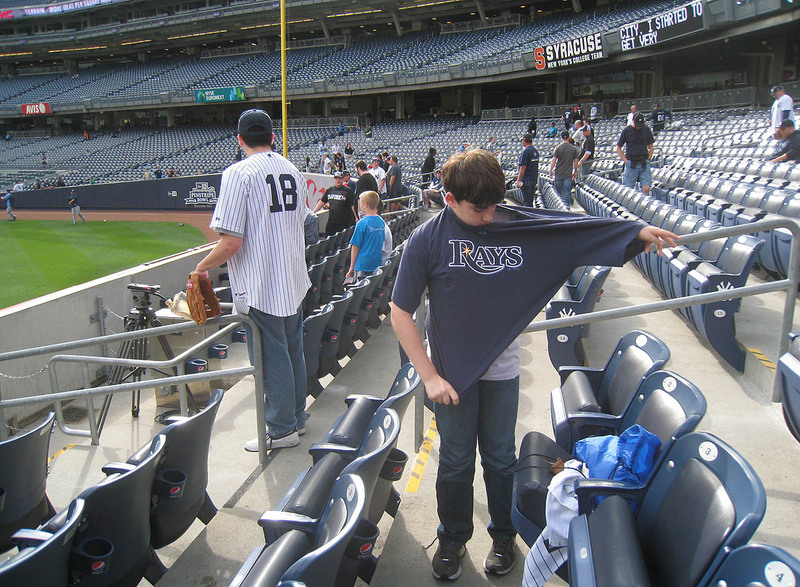 Once he got his arms through the sleeves, I grabbed his drawstring backpack (no need for him to carry it) and led him into foul territory. From that point on, Max and I worked as a ballhawking team. 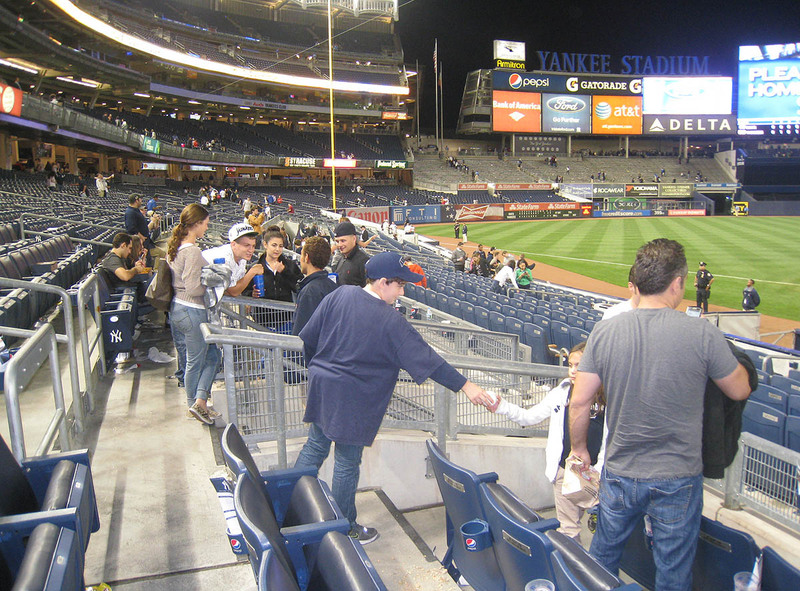 I shouted at the players and got their attention, and when they threw the balls toward us, Max made all the catches. Here’s a photo of B.J. Upton throwing one . . . 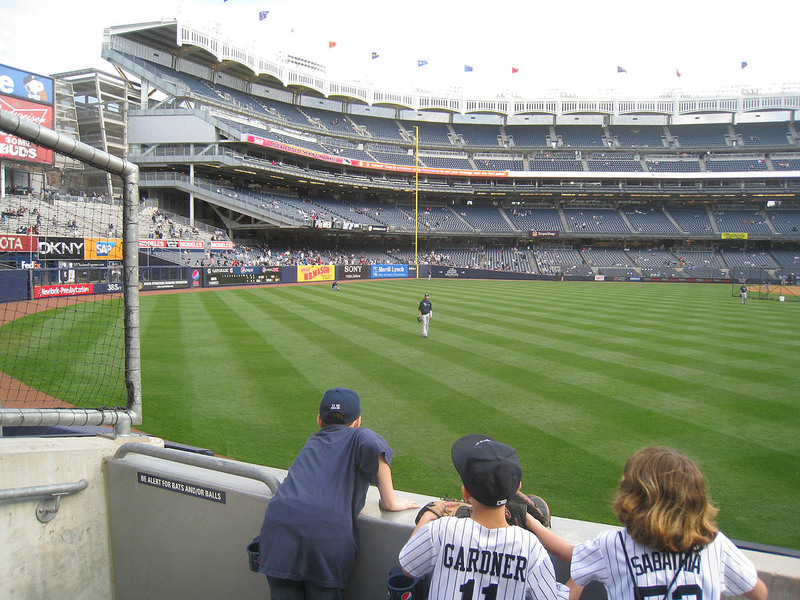 Unfortunately, because Yankee Stadium is crazy-strict, that was as close as we could get to the field, but it didn’t seem to affect us. I was shouting so loud that the players could easily hear me, and Max was killin’ it with his no-effort catches. He had already doubled his lifetime total, and I had a feeling that we were only getting started. 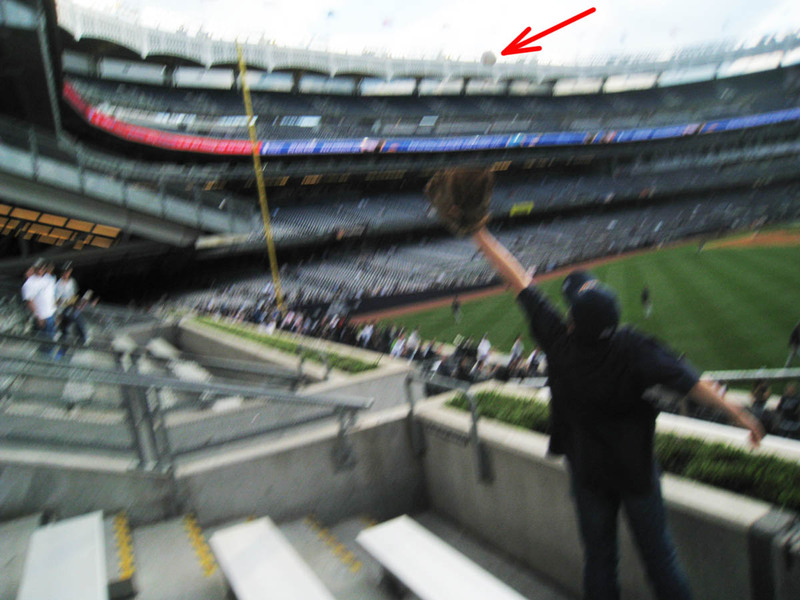 That photo was blurry because Badenhop airmailed Max, and if I hadn’t ducked out of the way, the ball would’ve hit me. 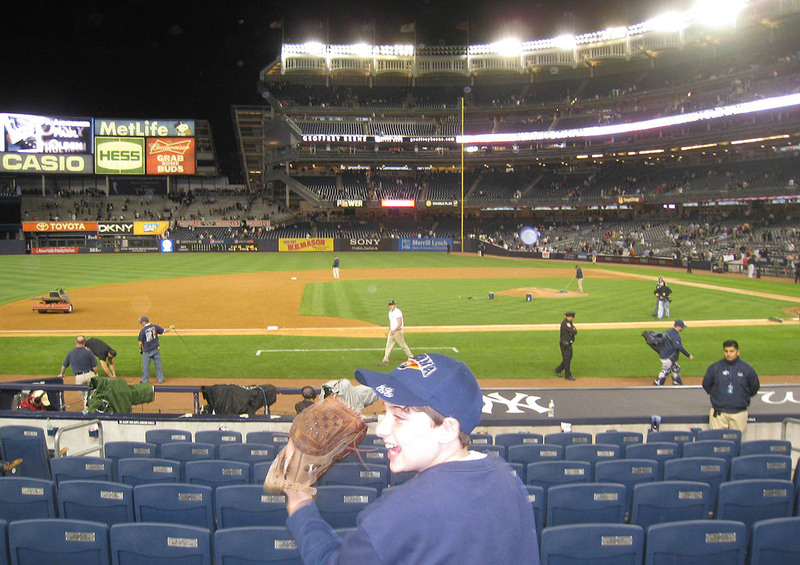 I suppose I could’ve caught it, but like I said before, I didn’t want to snag any more balls, and also, because the bleachers were mostly empty, I figured that Max would be able to scramble after it — better for him to snag it on his own than have me catch it and hand it to him. 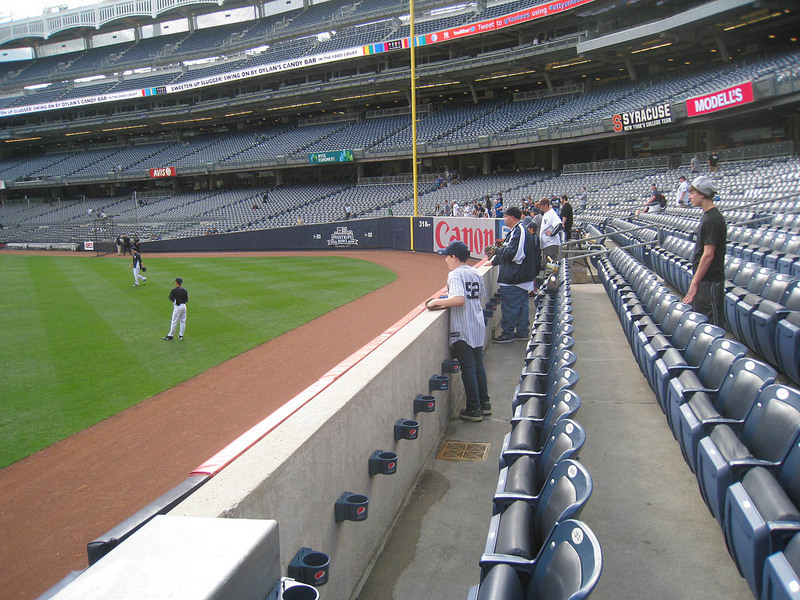 The ball landed in the fourth row, bounced back to the 10th row, and started trickling down the steps. I quickly chased after it and positioned my body between the ball and the nearest fans. They got the message, and Max ran over and grabbed it moments later. 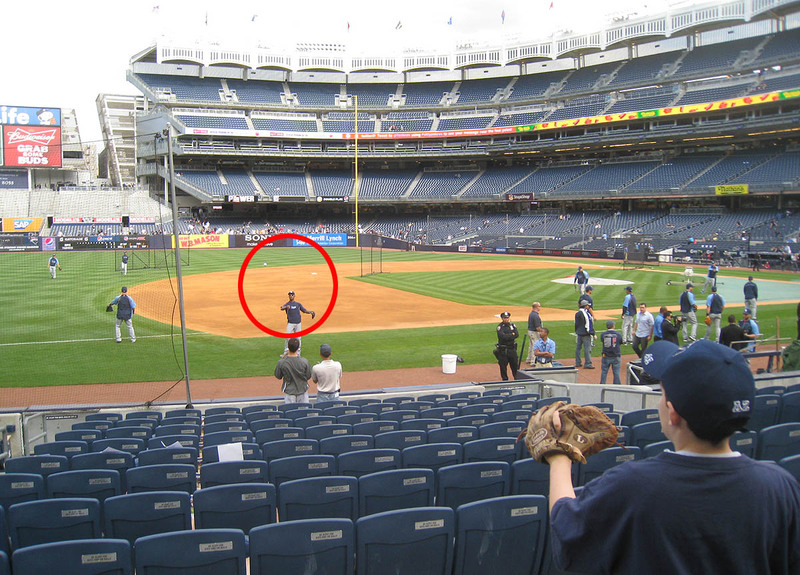 He had now snagged more balls in 45 minutes of batting practice that he had up to that point in his entire life. The ball had disappeared from my view for a moment . . . but he caught it! That was No. 5. 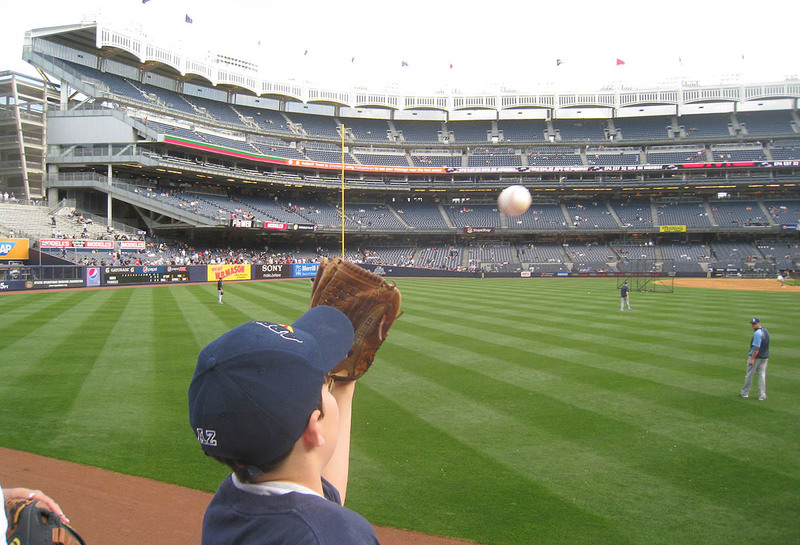 Toward the end of BP, Max caught this toss-up . . .
. . . from J.P. Howell. He now had six balls. That was DOUBLE his previous lifetime total. When the Rays cleared the field, I noticed that Wade Davis had a ball in his hand, so I shouted at him and got him to throw it to Max. BOO-yah!! That was No. 7. In both versions of the photo, you can see Max’s hat and glove at the bottom. 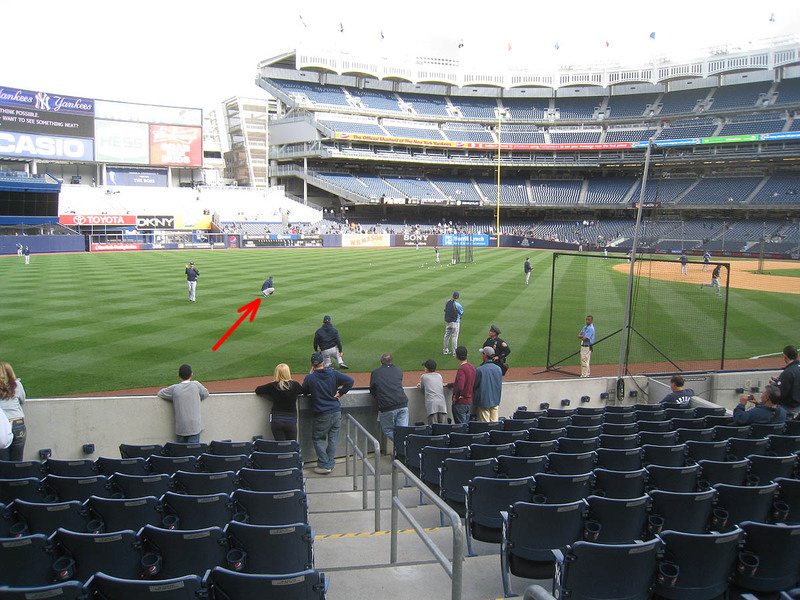 The player standing directly above his hat is Desmond Jennings. 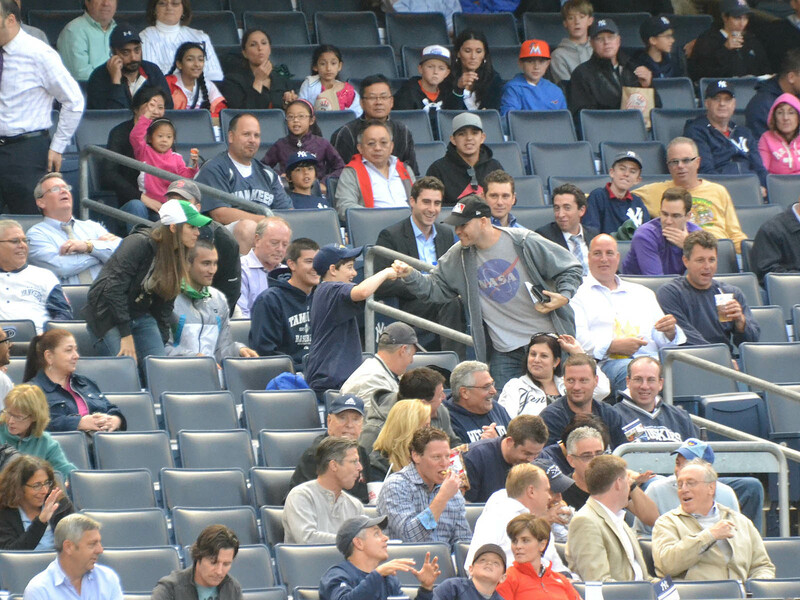 That’s who threw the ball, and this probably won’t come as a surprise, but Max caught it. Our seats were in a section that had waiter service, but eh . . . who needs it? 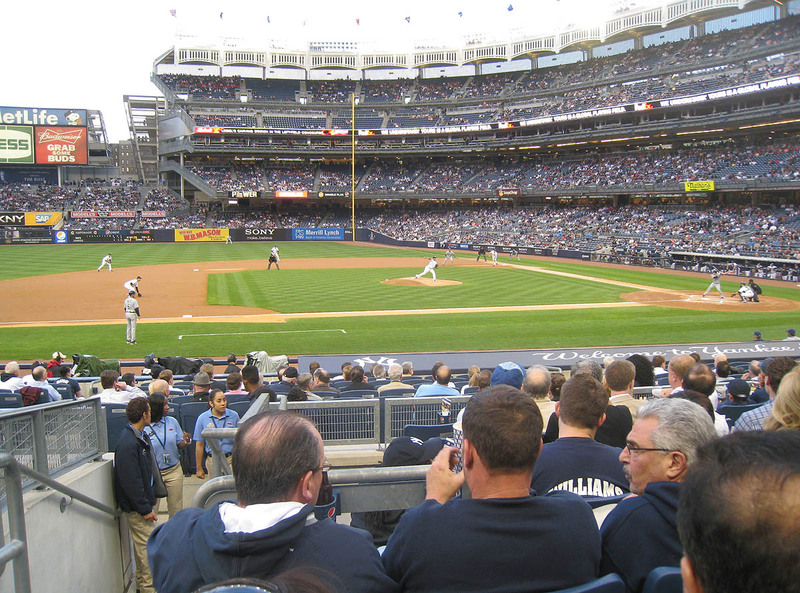 The way I see it, a waiter at a baseball game is just one more person to block my view, and anyway, Max and I were hungry for stuff that wasn’t on the menu. Did you notice my wallet and (print-at-home) ticket in the photo above? I was still holding them in my left hand. 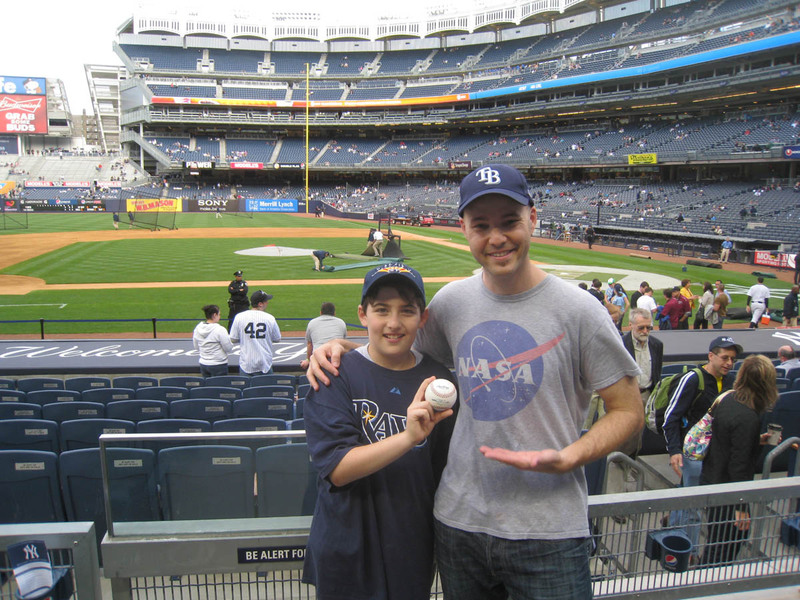 The man who took that photo asked me if that was the first ball I’d ever gotten. “No, I’ve actually snagged quite a few,” I told him, although this ball DID represent a first. 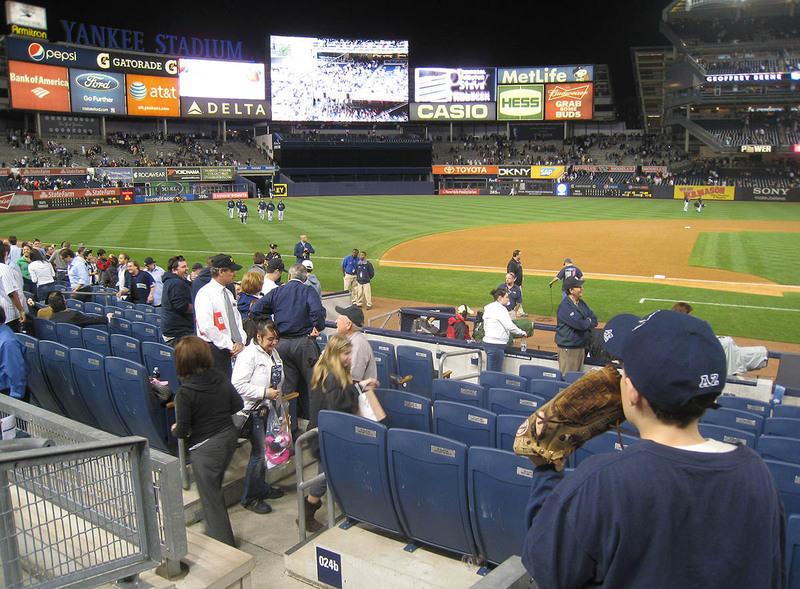 As I mentioned last night on Twitter, it was the first foul ball that I’d ever gotten during a game at the new Yankee Stadium. The ball was sticky with pine tar, so Max and I were taking turns smelling it. It might not look like much from this angle, but damn, it was a LOT of food. Imagine the very biggest popcorn bucket at a movie theater, but instead of popcorn, the bottom half is packed with french fries, and the top half has a selection of sliders (two beef, two buffalo chicken, and one regular chicken). Oof. 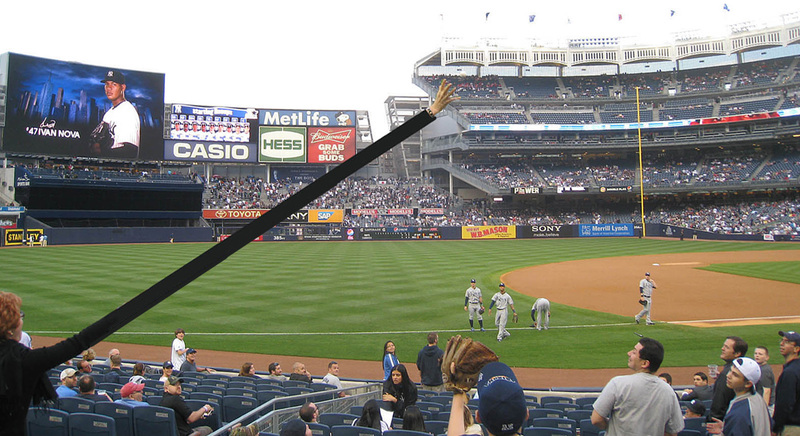 As you can see above, one arrow is pointing at Max, and the other is pointing at me. 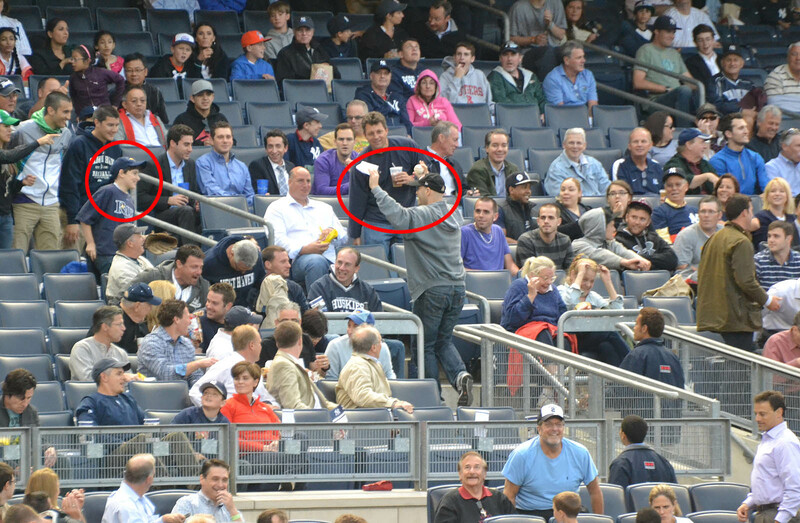 Every half-inning, Max went down to the bottom of our section and tried to get balls tossed to him. 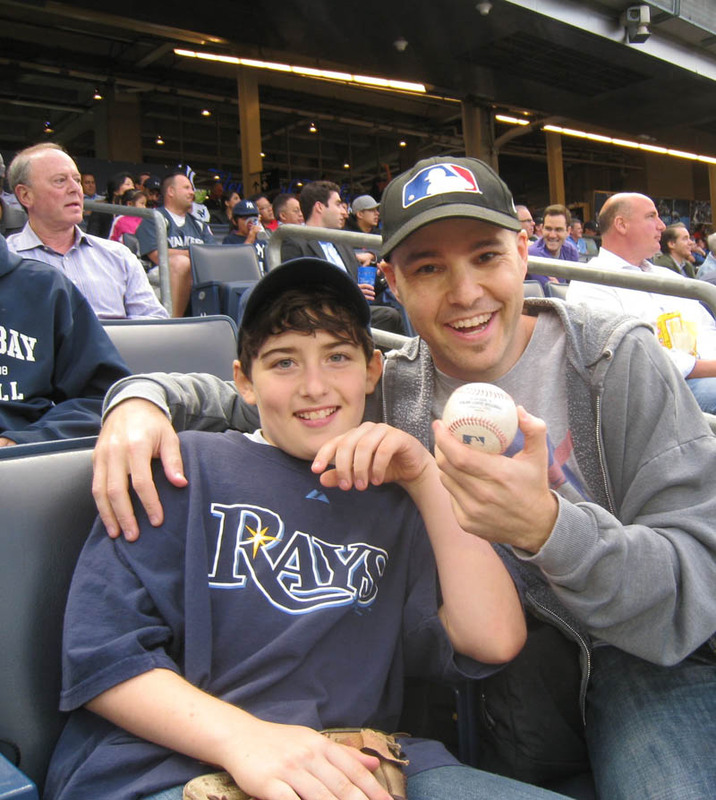 When the Rays were taking the field, he went for the infield warm-up balls, and when the Rays were coming off the field, he went for 3rd-out balls. I think he had fun trying — it’s more fun to get up and shout at the players than to sit still and do nothing — but no one showed him any love. It was too noisy and crowded for him to be spotted, and there were too many adorable, little kids sitting directly behind the dugout. 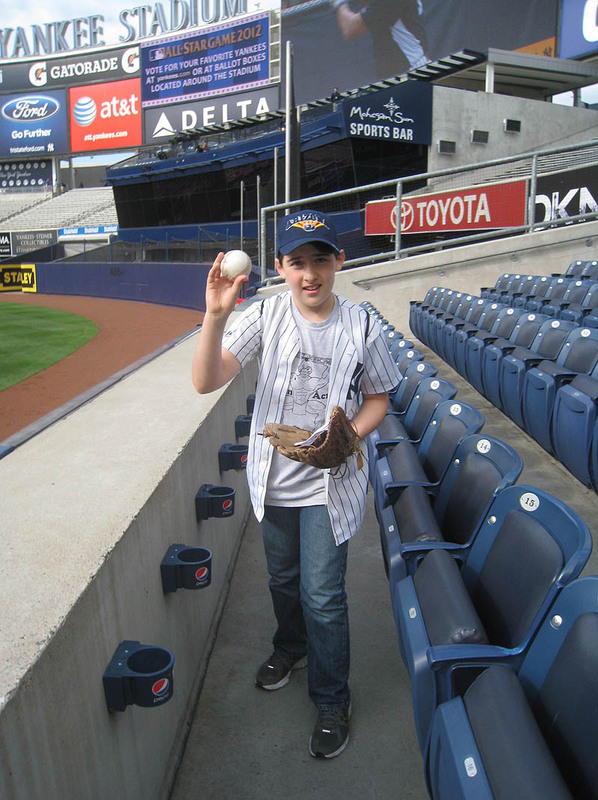 When the Yankees put the finishing touches on their 4-1 victory, Max knew exactly what to do. 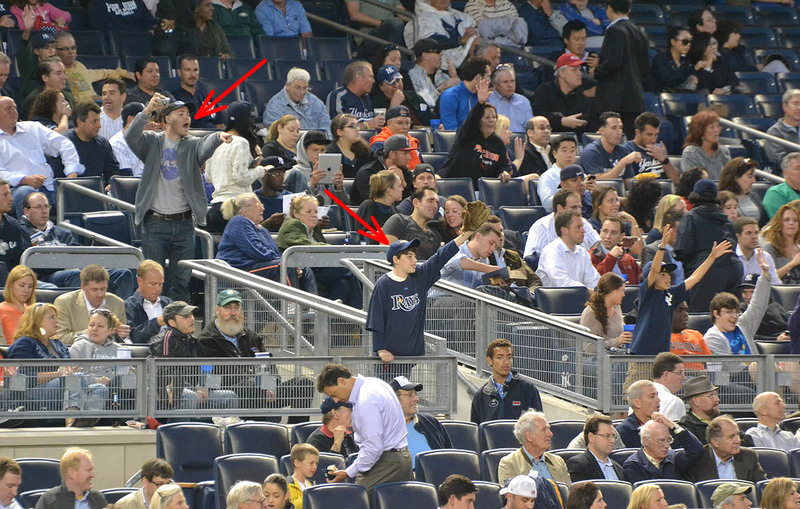 We’d been discussing our post-game strategy during the 9th inning, so after the final out, he made a beeline down to the bottom row. We weren’t able to get the home plate umpire’s attention, but when the Rays relievers and coaches started walking in from the bullpen . . .
. . . I was hoping that one of them would have a ball. I think it would be safe to say that he was having fun. 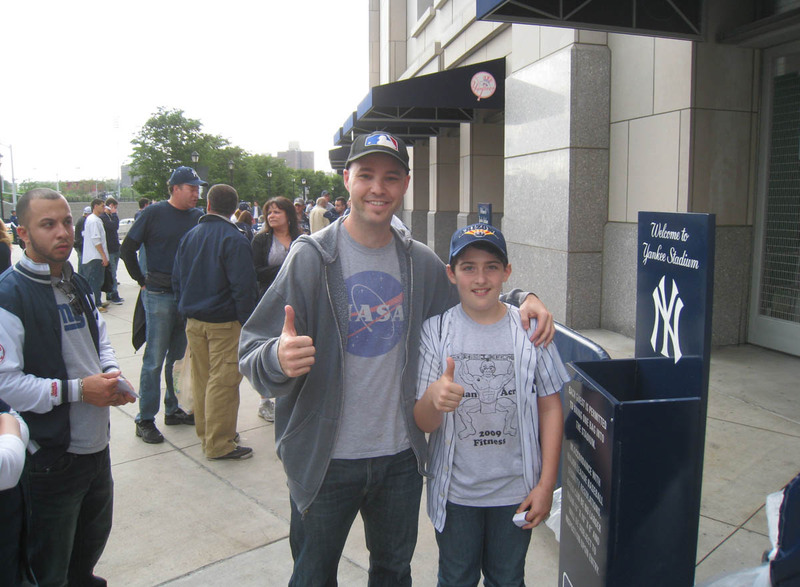 Max is an absolute baseball nut who knows more about statistics and the history of the game than most grown-up fans. He and I talked baseball all night, and if the game had lasted 100 innings, we wouldn’t have run out of things to discuss. “Oh yeah? What was so special about it?” I almost started laughing because I had no recollection of that game. I was three years old when it took place, and I had a feeling that I was about to get schooled by someone who would’ve been negative nineteen. Mike Easler?! Yeah, I’d heard of Mike Easler, but how the hell had *he* heard of Mike Easler? (Mike Easler?! Seriously?) And so it went — another long conversation about baseball as the No. 4 train rumbled back to Manhattan. • 179 balls in 24 games this season = 7.47 balls per game. • 34 consecutive Watch With Zack games with at least two balls; click here to see my complete Watch With Zack stats. I’m glad I subscribe to this blog! Now time to read it! Great entry! 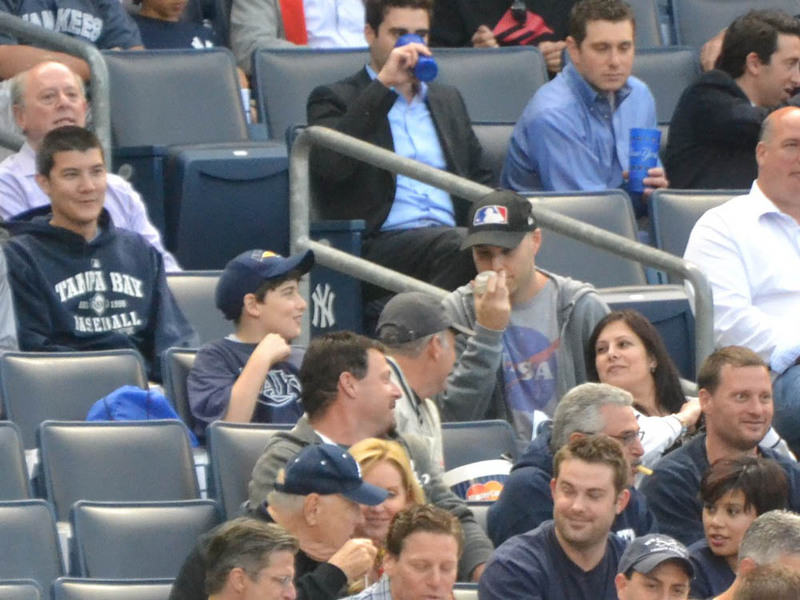 It looks like Max had a great time with you at this game…. and Dang! I wouldn’t be able to eat a bucket of that much food! Nice night at the stadium. I actually spotted you guys a few times, but I didn’t want to interrupt. I saw him snag No. 5. Nothing like almost tripling your life total. I somehow managed 3 myself. I tried making a sign for Matsui (all time favorite player) in Japanese but alas, he ignored me. 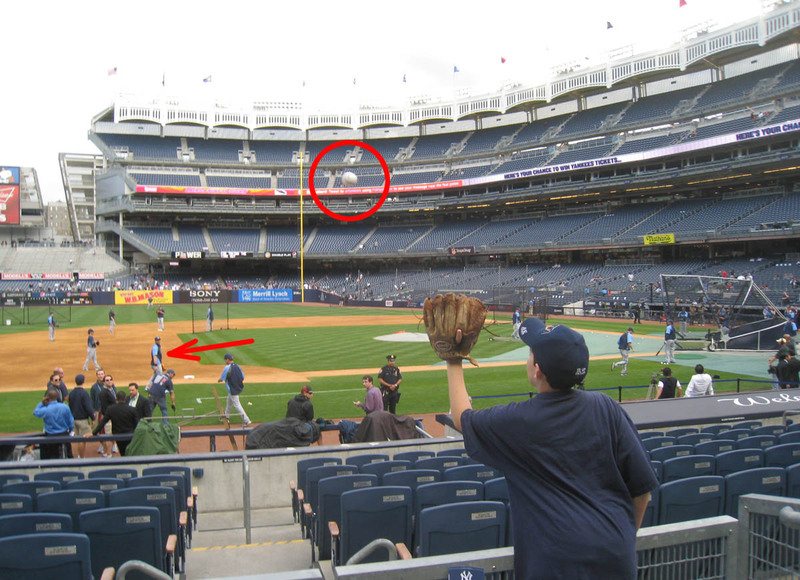 I tried the sign on Kuroda as well, but turns out my sign said “I’ll throw you a ball ” instead of “throw me a ball”, which explains him laughing at me. Oh well. I’ll get Kuroda eventually. Best of luck in Boston, get that 6,000. 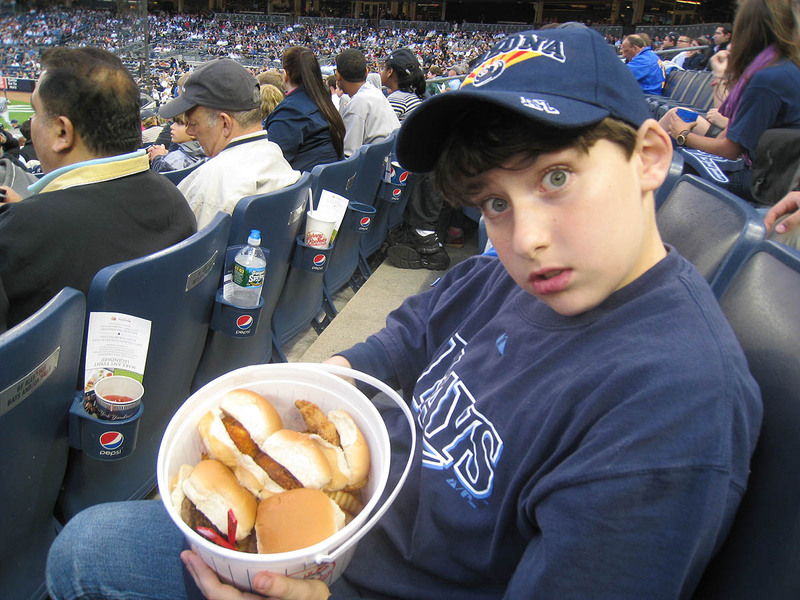 Zack, for $35 on 6/18, you can check out BP at Citi Field from the warning track and get an $18 food voucher and a ticket to the game. Not a bad deal! Zack- Where are your seats going to be at the Red Sox game? Zack WOW! What a blow by blow account of your time at the game with Max. I can tell you he still can’t wipe the grin off his face from catching all those balls and meeting such a “fellow fiend”. 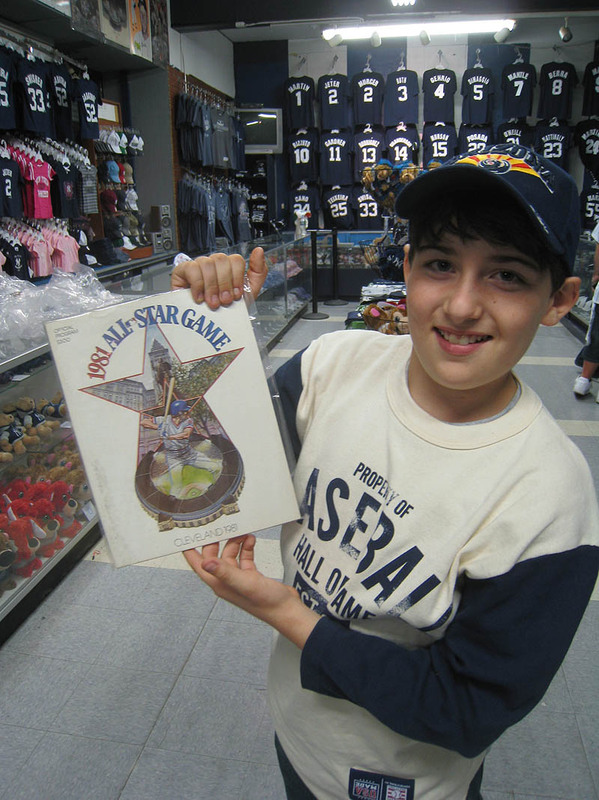 I’m just concerned because if he develops the “ballhawking” to the extent he’s developed his baseball card obsession than living in New York City will no longer be an option…. Mike Easler was the Bisons’ hitting coach last year and I met him. He was pretty nice. 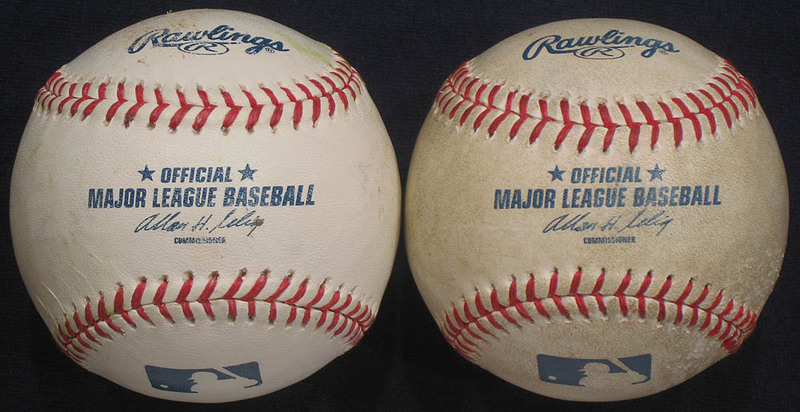 How many baseballs in your collection do you actually have possession of? That was a very nice ending to your entry; almost after school special-ish (in a good way with no sarcasm intended). You’re a good man Zack. Max is certainly a great kid! Zack- I have been looking where the Lena Blackburne mud is taken for a long time, and I have almost solved this mystery! Watch this video at http://gizmodo.com/5850268/every-baseball-is-rubbed-with-this-special-mud-before-it-gets-used, and they say it is near the tacony palmyra bridge, and during this video around 1:40 a marina type area pops up. I am looking around on google maps to find out what this area is. If I do find out the exact location, Zack I will email it to you, but I think it should be kept a secret unless you disagree. Whats your opinion? He sure did. And I had a great time with him. I really don’t think that the day could’ve been any better. You are the king of random. Nicely done! And yes, thank you for taking that excellent photo. If only that would happen with home run balls. Ha! That’s hilarious about the sign. You should’ve come over and said hello. It wouldn’t have been an interruption, although I don’t think I would’ve been able to talk much. Thanks for the link. I’m gonna check that out. Sorry I didn’t reply sooner. 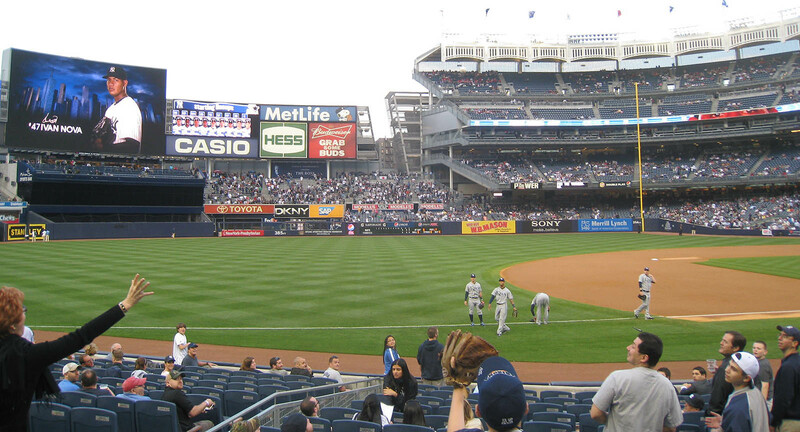 I bought a cheap seat and stayed near the 3rd base dugout. As for the mud, if you think it should be kept secret, then why are you talking about it here? I’m kidding . . . kind of. Listen, it’s not your job (or mine) to protect that secret, and if the info is out there, then it can certainly be discussed. Your call. It was fun playing that role.